Geographic Range: Although jade plants are native to South Africa’s Cape Province, they are grown worldwide now due to their ability to grow in dry, poor soils. Many people keep jade plants as house plants, though they can grow outside in many southern and west coast states. 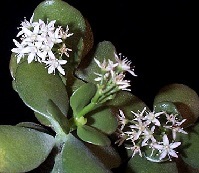 Places that receive too much rainfall will not provide the best growing conditions for jade plants, but they can certainly be grown indoors in those areas. -With a USDA plant hardiness zone ranking 10-11, jade plants can survive winters as cold as 30 degrees! Range: Sumatra (Indonesian Island) is the only place that it grows in the wild, where it grows in rainforests on limestone hills. The flower is also cultivated by botanic gardens and owned by private collectors in other places of the world. 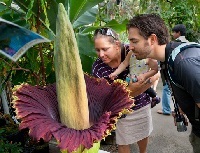 Interesting Facts: This plant is very interesting due to its sheer size, as it can weigh up to 200 pounds, and also its bright colored flower. Its most unique characteristic is that it gives off an odor similar to a rotting mammal in order to attract beetles that help pollinate the flower. This flower is not actually one flower, as it is actually thousands of individual male and female flowers.